The café chain of Ziferblat (Clockface Cafe), a revolutionary Russian start-up where patrons are charged only for the time they spend inside, is planning to launch its business in New York. Ziferblat is the brainchild of founder Ivan Mitin, who came up with the groundbreaking concept of a free café where guests are charged only for the time they spend there. Patrons can read, work, play games, play piano, listen to lectures, drink free tea and coffee and even bring their own food, all in a laid-back bohemian atmosphere. Mitin and his wife are currently looking for a location in the trendy Brooklyn neighborhood of Williamsburg and plan to open their time café in the upcoming months. They are searching for a premises with an area of 1076 sq ft and promise that the New York Ziferblat will be furnished in a similar style to the London one, without any mass-produced furniture. The New York venture will be the third Ziferblat café to open abroad. In March 2012, Ziferblat appeared in Kiev, and in December 2013 the chain opened a branch in London's fashionable Shoreditch neighborhood. The chain consists of eight cafés around Russia, the first of which opened in fall 2011. 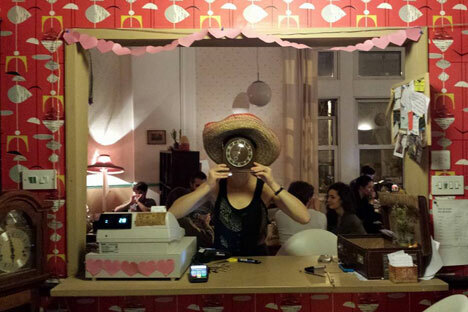 The London Ziferblat café has been featured in reports by the BBC, CNN, and USA Today. Based on materials from the Village magazine.